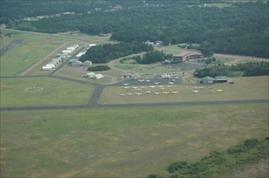 The airport is located halfway between the Twin Cities and Duluth and is outside of Class B airspace. New runway markings are present at Burnett County Airport. Runways formerly designated as 04/22 and 13/31 are now 05/23 and 14/32. Runway 14/32 was reconstructed and extended to 5,000 feet during the summer and fall of 2009. The runways are well-maintained and in excellent condition. Both runways have pilot controlled lighting.